Find your home away from home at Dusty’s Beach Ball. This pet-friendly cottage is situated on the oceanside of Salvo in the quiet Hatteras Colony neighborhood, just four lots back from the oceanfront with a community beach access path right at the end of the cul-de-sac. Enter through the ground-level garage, which provides ample storage space for all your bikes, beach toys, and fishing gear. A few steps up from the garage is the convenient laundry area. All three bedrooms are on the middle level, each with TV and DVD player. 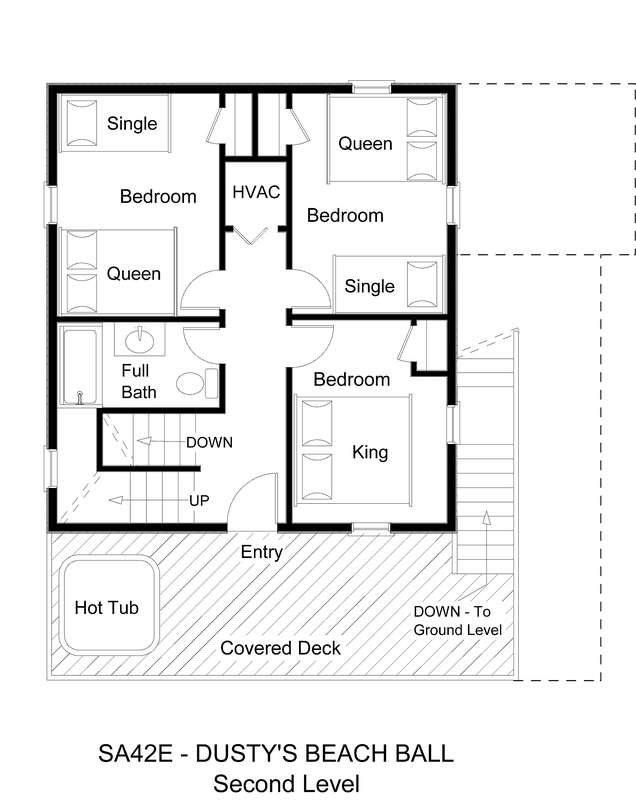 Two bedrooms each have a queen bed and a single bed. The third bedroom has a king bed. A full bathroom is off the hall. Step out onto the covered deck with stairs to the ground to relax in the bubbly hot tub and soak your worries away. Come together in the open living and dining room with adjacent kitchen on the brightly decorated top floor. Between the breakfast bar and the dining table, there is ample room for family feasts. 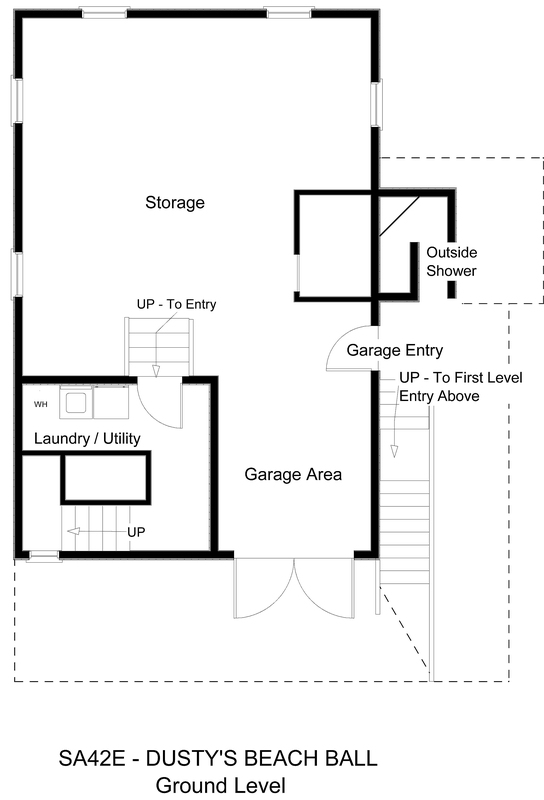 An additional full bathroom is situated off the living area. Step out onto the screened porch for al fresco dining to the sound of the ocean in the distance, or enjoy distant horizon ocean views from the sundeck. Head up to the rooftop crow’s nest, the perfect perch for panoramic sunrise to sunset views that will take your breath away. The kids and pets will love the large, grassy yard, and the whole family will relish leisurely strolls and bike rides through the neighborhood to the locally-owned ice cream shop. Plenty of books, DVDs, games, and puzzles are sure to keep the whole family entertained. Hit the beach to feel the sand between your toes and splash in the waves. Enjoy the relaxing retreat you’ve been craving at Dusty’s Beach Ball. What kind of Loyalty Discount does this house offer? We stayed last year and loved it! Loyalty discounts are set by the owner and vary by season. Please call our helpful reservations staff to find out the discount available for your chosen dates. If you are on the fence about this house, book it! The photos do not do it justice! We were absolutely pleasantly surprised when we arrived. It is much more spacious than it appeared on the website photos. The house was extremeley well kept. There were lots of little extras we didn't expect either..blow up kayak etc. The garage under the house was really useful with dog wrangling lol & for loading the car during storms, etc. We liked the location alot too! (On a quiet cul de sac -3 houses down from the beach access too) This was by far the most pet friendly place we have rented in OBX. Great back yard (large, real grass, not just patches with sand cactus etc) having garage to get them cleaned up (off leash) before bringing them inside.The ONLY negative was not having much cover from rain on decks, aside from the small screened area on upper deck. That was a small sacrifice, and only mattered because we had a tropical storm pass while during our stay. The value of the rental was the biggest bonus. We loved it, definitely on our list for next year's vacation!!!! We loved the garage to leave all our beach gear in, great to hang towels and suits in. No worry if they would blow away. Very well maintained home with new appliances and furnishings. Personal decor makes the house seem very homey. The king sized bed was very comfortable. 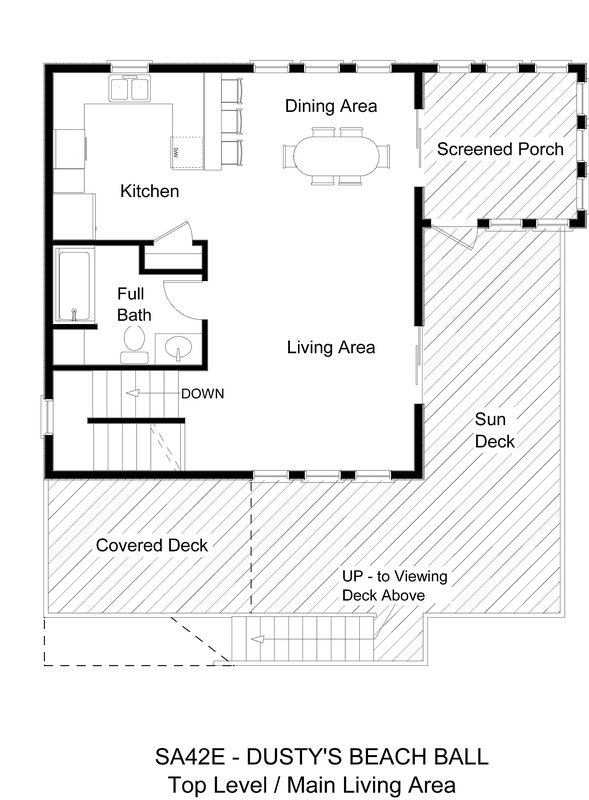 The rooftop deck is very nice and sits above the decks of the other (larger) homes on the street. Nice big back yard for our dogs. Fairly short walk to the beach. Road is nice and quiet too. Dusty's exceeded our expectations. It was very clean and in excellent repair (thank you owners, previous conscientious renters and Midgett cleaning staff) and comfortable, especially the living room furniture. We loved the hot-tub, screened in porch and quality outdoor seating. Loved the crow's nest as well. The garage was especially nice for unpacking and packing with no mosquitoes or rain. Decor was very nice and well thought out.